Deene Park were delighted to host a 5K run around the park last Friday evening. 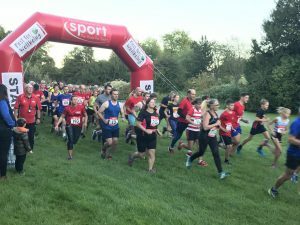 Run by Northamptonshire Sport, we had 190 finishers on the night from a number of clubs including Corby, Kettering , Wellingborough Desborough and Olney. The overall winner was Mark Almond in a winning time of 17 mins 11 secs with Matthew Dicks of Olney in second and Finbar Myers of Rugby and Northampton in third. The ladies race was won by Lucy Watts of Wellingborough (7th overall) in 20 mins 29 secs with Kelly Barnett of Wellingborough in second and Elaine Fairbrother of Kettering in 3rd. Only 17 secs behind third Zennor Coombs was fourth female and Sally Coombs 5th. The feedback we have had has been very positive with comments such as “Deene Park was a real cross country course and I loved every minute of it” and “Well organised and well marshalled”, all the runners enjoyed the very scenic route along the lake and across the multi-terrain park on a warm autumn evening.